Boxwoods with light brown to golden brown leaves are common this spring in Greater Cincinnati. Some of the leaf browning is due to winter injury with foliage at the tips of branches, particularly at the tops of plants or on the windward side of plants, most heavily affected. Some was caused by salt damage either directly with "ice melt" or rock salt inadvertently thrown onto foliage, or indirectly with "salt spray" carried onto foliage from nearby roadways. Salt damage is sometimes, but not always, concentrated on wide side of the plant. However, a close examination may also reveal the telltale blister-like leaf symptoms caused by the boxwood leafminer (Monarthropalpus flavus). 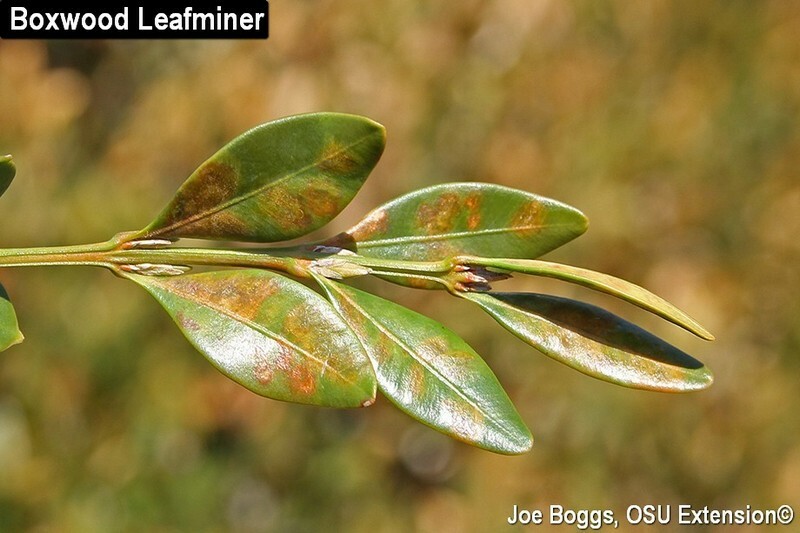 Leafmines may be found throughout the plants although the highest concentration also occurs on foliage at branch tips. Normally, the blister mines turn brown a bit later in the spring. However, I'm noticing this year that the blister mines are turning brown much earlier and there appears to be a connection to widespread winter injury. I'm not certain if winter injury is magnifying the leafmining damage, or vice versa. Gently separating the upper and lower leaf surfaces (the leafminer had already done most of the work!) will reveal the bright yellow leafmining larvae (maggots) of this midge fly wiggling around in their blister mines. The larvae will soon complete their development and pupate. The pupae are also bright yellow at first, but turn orangish-yellow as this stage nears completion. This non-native midge fly was accidentally introduced into North America from Europe in the early 1900s and is now common throughout Ohio, particularly in the southern and central parts of the state. Adults emerge at around the same time red horsechestnuts (Aesculus × carnea) and doublefile viburnums (Viburnum plicatum) are in full bloom (440 GDD). Except for their bright orange abdomens, the adults superficially resemble miniature mosquitoes. A close examination of the leafmines at this time of the year may also reveal small translucent "windows" created by the larvae in the lower leaf surface. The pupae will wiggle through these weak points to ease emergence of the fragile adults. Damaging boxwood leafminer infestations can be suppressed through applications of neonicotinoids such as imidacloprid (e.g. Merit, Xytect, Marathon, and generics) or dinotefuran (e.g. Safari, Transtect, Zylam). However, application timing has been modified in recent years to avoid negative impacts on pollinators. Boxwood blooms attract a wide range of pollinators; blooming plants can literally buzz with their activity. Therefore, the insecticide applications must be delayed until AFTER boxwoods bloom. Some minor miner damage will occur, particularly with the imidacloprid that is taken-up more slowly compared to dinotefuran. However, this is a small price to pay for protecting pollinators.